My name is Christine and I first heard about Fetch a Cure when I saw a brochure at the Oncology Service at Dogwood off of Broad Street. 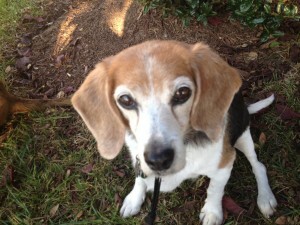 Our beloved beagle, Cindy, was diagnosed with cancer and we were referred to Dr. Angharad Waite at the Oncology Service. Our Cindy passed in February due to complications of cancer. We decided to honor her memory and volunteer for your organization. My husband and I volunteered during the Home and Garden Show at the Richmond Raceway early Spring. However due to various circumstances, grieving being one of them, we have not been able to volunteer at any additional events. We hope to change that shortly. However, I would like to share an article that I was asked to write for the UK Guardian. After Cindy’s passing I was so distraught that I reached out to the Center for Human-Animal Interaction at the VCU School of Medicine. I had a few grief counseling sessions with Dr. Sandy Barker. Dr. Barker was approached by the UK Guardian to write an article on pet loss and when is the right time to get another pet after a loss. She called me to see if I would be interested in writing the article. I almost declined because I did not think I had the energy to put my thoughts on paper. I accepted and the article was published. I think Dr. Barker knew this would be cathartic for me, and it was. Many a tear flowed the weekend I wrote the article. It was helpful for me, but also if after reading the article if at least one person goes to their local rescue or shelter and adopts a dog or cat, mission accomplished. Attached below is the link to the article that I would like to share with the wonderful folks and volunteers at Fetch a Cure. I hope to see you again soon.